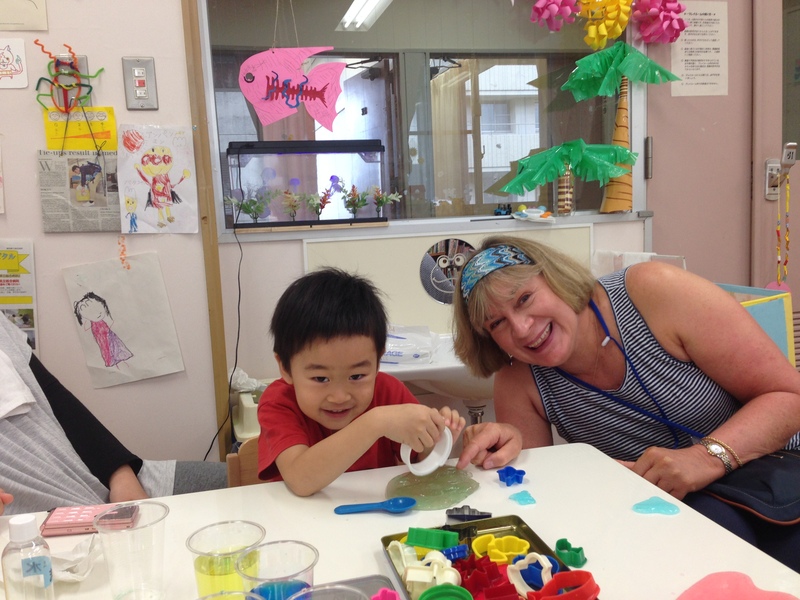 While teaching in Shizuoka, Japan, I had the pleasure of spending a morning with Hideko Konagaya, a hospital play specialist, at Shizuoka General Hospital. Hideko hosted Maria Busqueta (a child life specialist and psychologist from Mexico City) and me in her bright and cheery playroom. Professor Chika Matsudaira of Shizuoka University assisted us by translating so that we could all communicate. When we entered the playroom, two preschoolers already sat at a small table busily making slime. The children and their mothers gave us permission to photograph them. Now I have made slime in my play course, but never slime as lovely as this! Hideko had set out brightly colored water in several plastic cups. She provided the boys with small glass jars (recycled baby food jars) and chopsticks for stirring. One at a time, Hideko and the children added rice glue, orange or lime essential oil for fragrance, sodium borate, and a magical touch of glitter. The mixture came together to create a wonderful substance that smelled amazing and was positively addictive – no one could put it down or stop playing. The boys stirred like mad, and then ran the slime through their fingers until it hardened enough to hold shape. They used cookie cutters and plastic tools to manipulate it. I broke a cardinal rule of mine and touched one of the boy’s slime without asking. I just couldn’t help myself! He was a very good sport. I took some time to photograph the room and noted several things about their use of space. It was not a large room, but it had areas devoted to literature, dramatic play, constructive play, expressive art, and sensory play. Each table had materials set out already, making them very inviting to all whose eyes lit upon the brightly colored materials. Chika explained the table set up for water play. 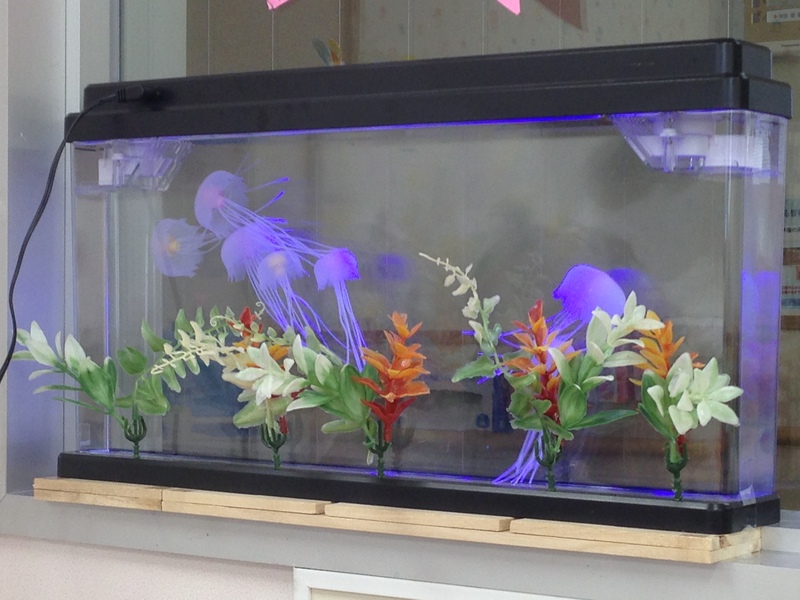 An aquarium filled with electronic squid sat in the window overlooking the hallway of the ward. 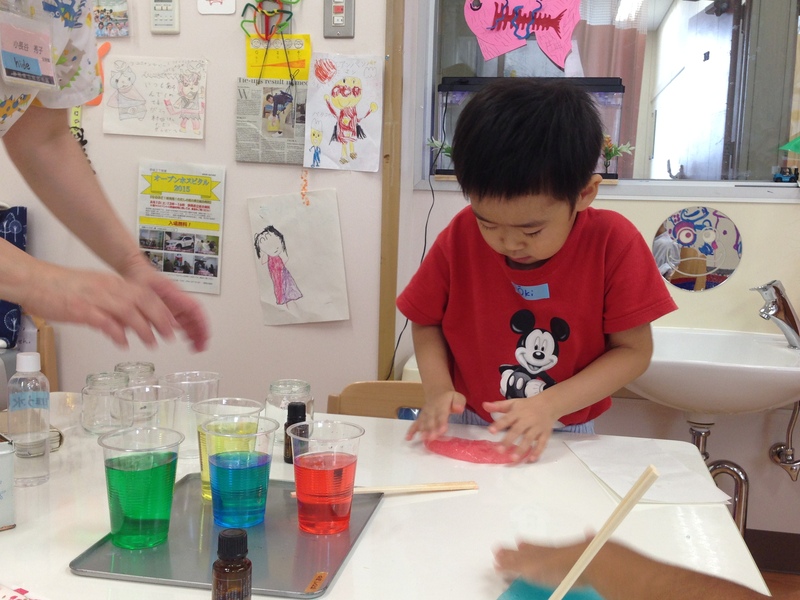 I thought about how the squid, chopsticks, rice glue and water toys were all symbols of the Japanese culture. They wouldn’t necessarily be found in American playrooms. Another interesting point was that there was not a medical play corner in the room. Chika explained that she felt it might frighten or intimidate children. She believes that medical play should only be provided as a therapeutic outlet at the discretion of the hospital play specialist, so that the play can be supervised and a child’s misconceptions corrected. I come from a different point of view. 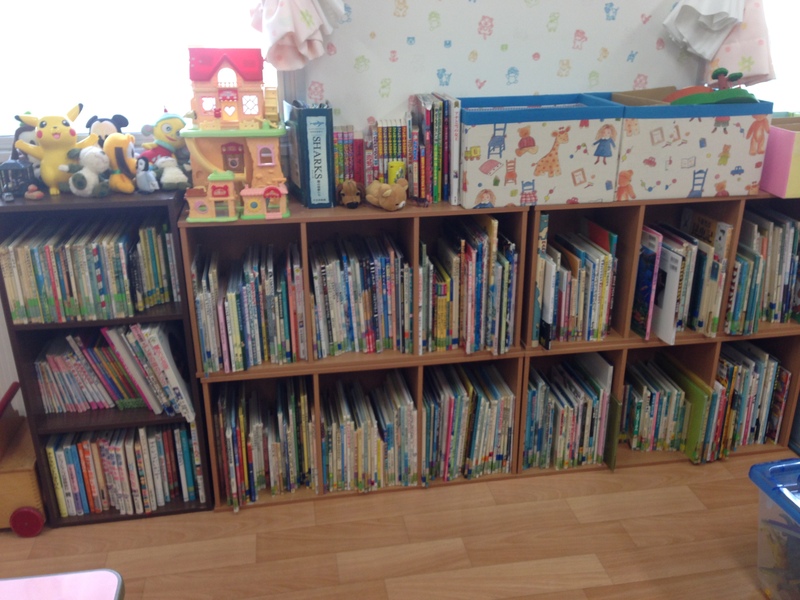 I believe that children know what they need to do when they see the materials, but might not know to ask for the medical play if it is not visible when they enter the room. 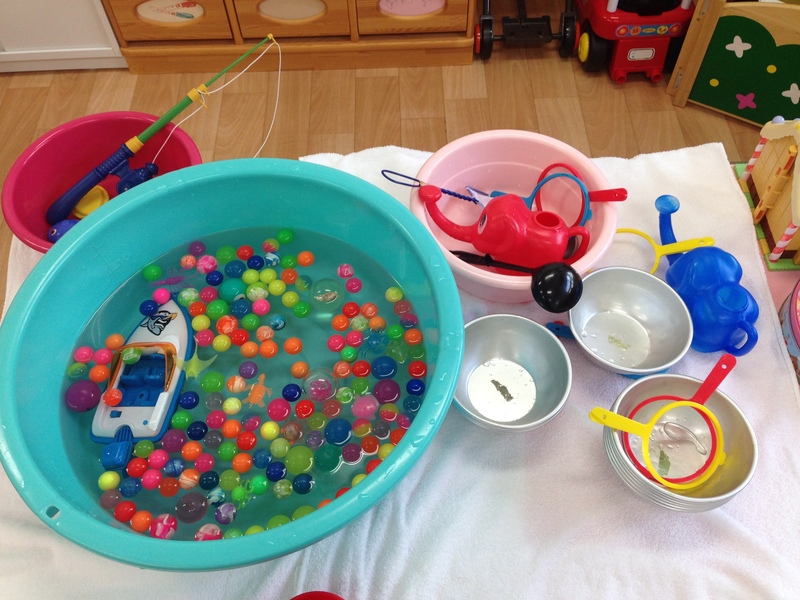 I don’t believe that all play needs to be supervised in order to have therapeutic value. 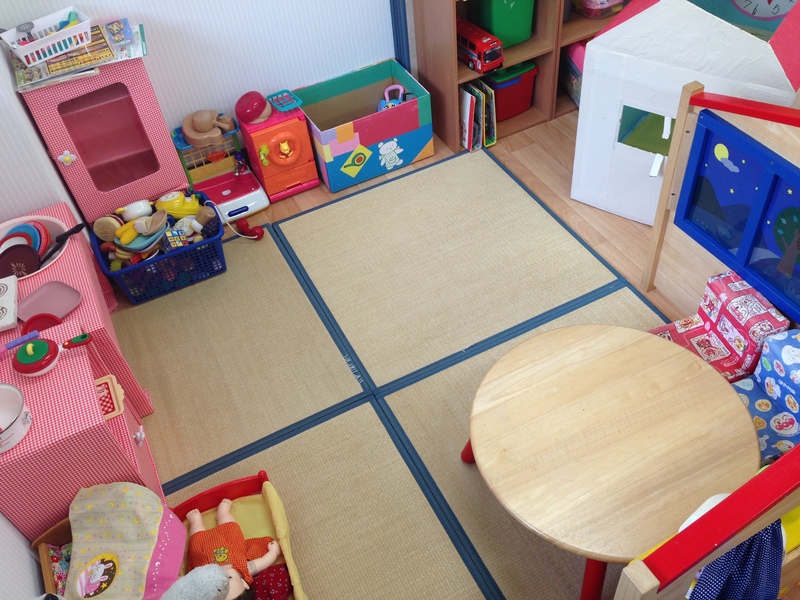 These different points of view generate good discussions and keep us all thinking about how we set up our playrooms. 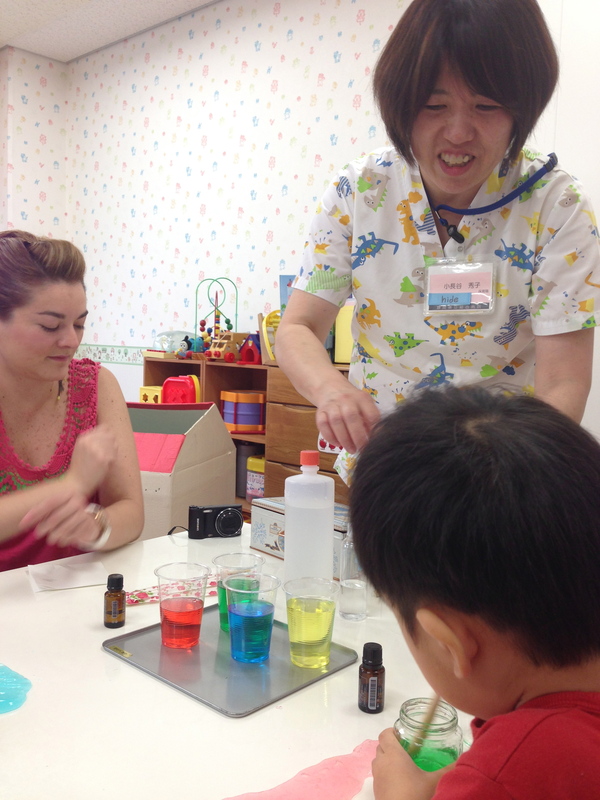 After the slime activity wrapped up, Hideko took time to share and demonstrate some of her teaching tools. She created a laminated book that she uses to prepare children and parents for throat and nose cultures, a common procedure that often causes great anxiety for young children. The drawings and simple language depict positioning for comfort, deep breathing, and steps to help the child and parent know what to expect. 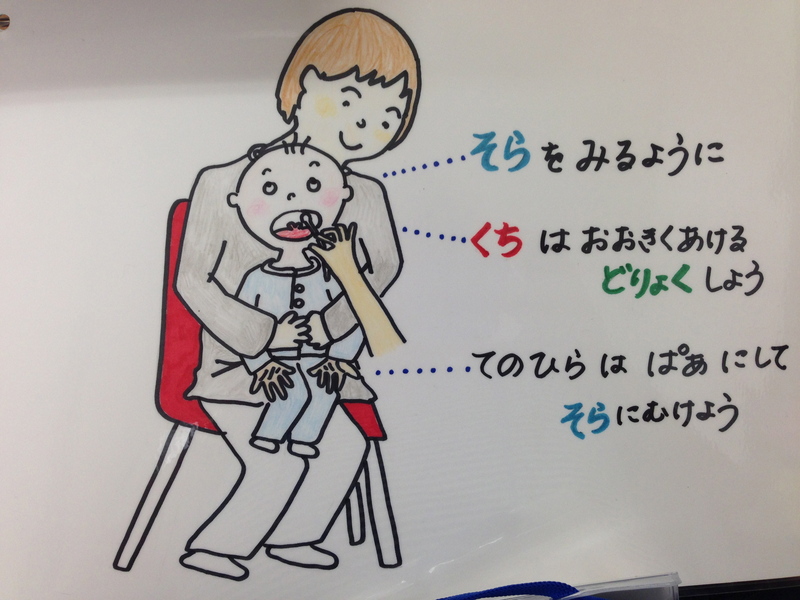 Hideko also has a laminated card for nurses and doctors that describes five steps for helping support a child through procedures when a hospital play specialist is not available. They include introducing themselves to the child, telling the child what is about to happen and where they are taking them, reassuring the child that their parent can stay with them, and describing what the child will feel and see. 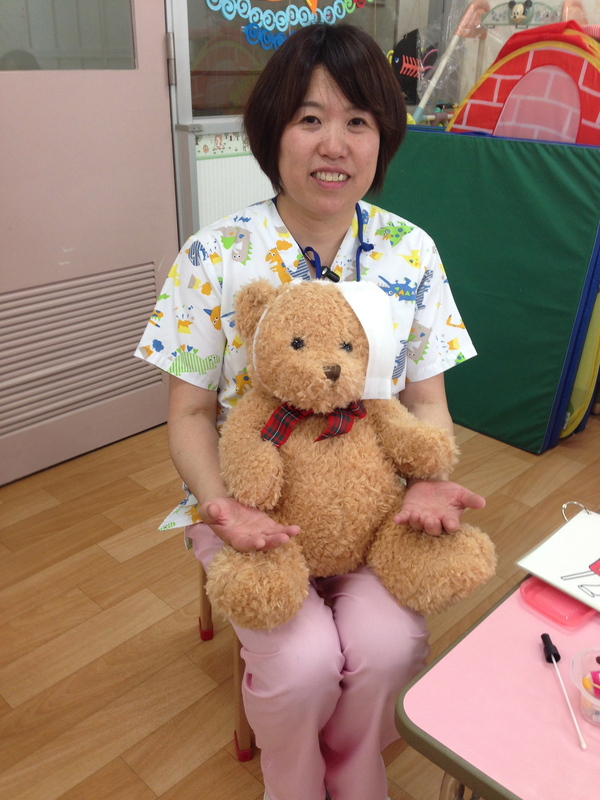 Hideko has a bear which she uses to prepare children for anesthesia. The bear is equipped with a bandaged head and an IV. But the really cool part is that the bear makes very realistic snoring sounds when Hideko places an anesthesia mask over his face. 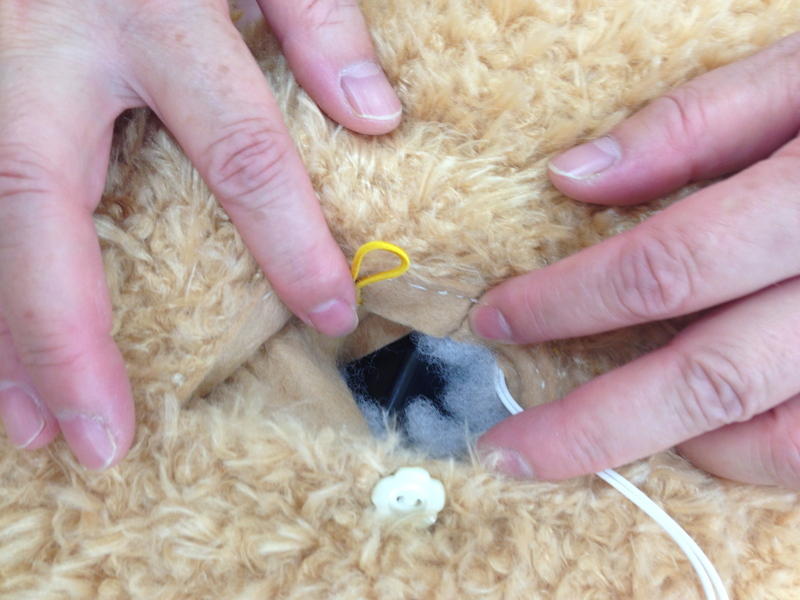 Hideko had creatively removed a digital recording device of snoring from another popular toy and inserted it into this bear. Let’s hear it for loose parts! 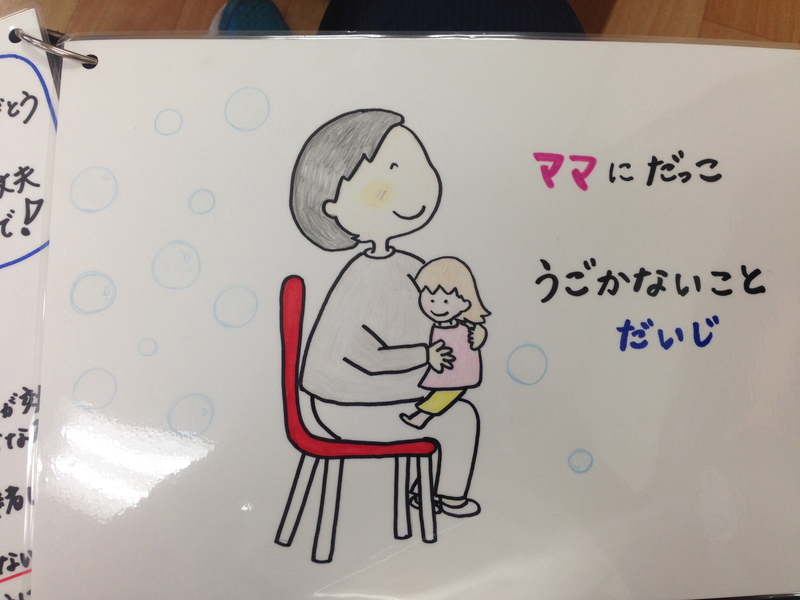 Lastly, Hideko shared her mechanism for teaching children about IVs. She has a life-sized felt cut out of a hand. The hand has a tiny hole in it at a place where IVs are commonly inserted. 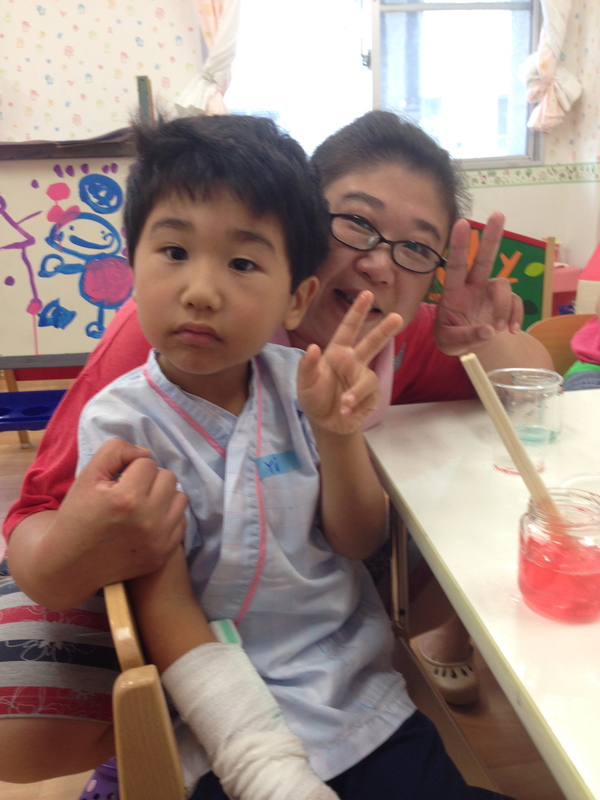 When preparing children for an IV insertion, Hideko takes a tiny plastic catheter from an IV needle, and shows the child how it goes into a vein in the hand and stays there to give them medicine and water. She believes that using a real needle will frighten many children. But she always asks the children how they think that the soft, little straw can get through a person’s skin. Then needles are discussed, along with coping strategies and choices the child will have during the needle stick. I would love research to be done some day on different ways to prepare a child, with and without real needles, to see which way is more effective in reducing anxiety. My guess is that no one way of doing things is right for every child. It’s good that we learn different approaches from one another. Our morning with Hideko wrapped up with a visit to a baby whose mother needed a break. We all took turns holding her and singing to her, in Japanese, Spanish and English. Life in the far East is good. This is my favorite one yet Deb!! !